Deliciously seasoned roasted vegetables with an incredible seasoning blend. 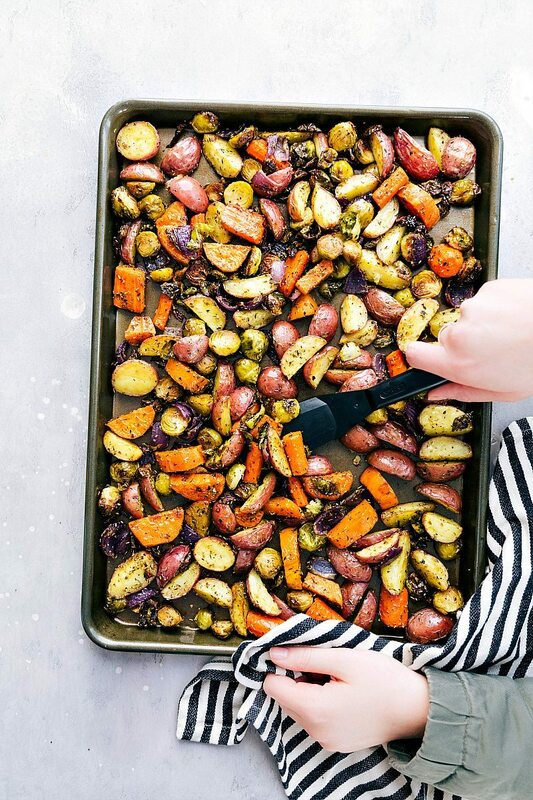 We make these roasted veggies at least once a week at my home — they’re great served alongside a meat-heavy dish or prepared ahead of time for healthy meal prepping during the week. These roasted vegetables make the perfect side dish to this crazy popular crockpot chili! OR use this chicken marinade recipe to grill up some chicken and serve with these veggies! 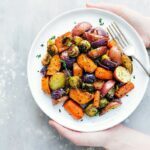 It’s about TIME we had some roasted vegetables around these parts 😉 December has been filled with way too much sugar (yes, I will finally admit that is a thing), and I still have a few cookie recipes to share before the year is through. I’ve mentioned before that I’ll be making (with plenty of help!) around 800 cookies for my sister’s wedding that is THREE days after Christmas. The perfectionist in me wants every recipe to be the absolute best and there has not been one day in December where I haven’t made/tested at least two batches of cookies. 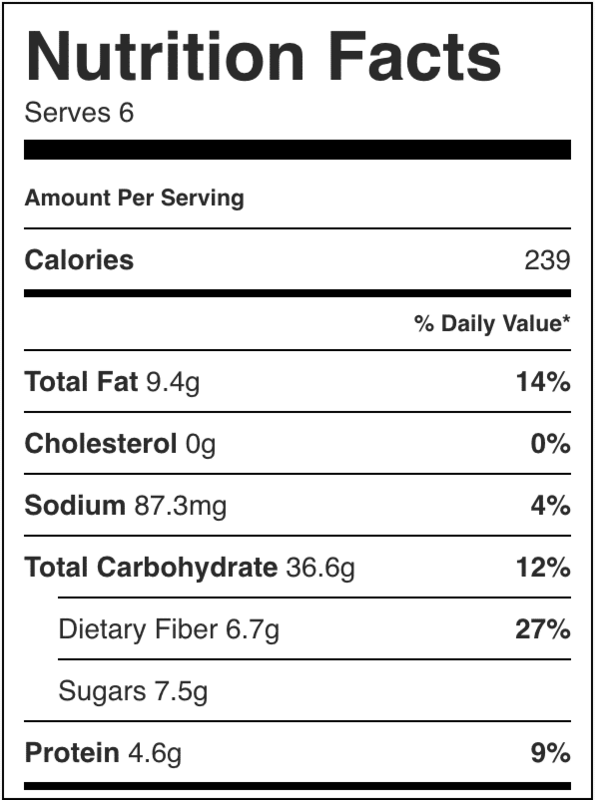 And unfortunately my testing is never lacking on taste tests…. So in my attempts to balance out some of this cookie and sugar madness, I’ve also been roasting a lot of veggies. This recipe includes a spice mixture that is my absolute favorite, and rest assured these vegetables are on the menu for our Christmas Eve dinner. This year I’m hosting Christmas Eve dinner and I’ll admit I’ve gotten way too excited about the menu. So far I’m planning on making these roasted vegetables coupled with this salad, this “salad“, and this salad. And of course ham + mashed potatoes are a must. These all will be paired with sparkling pomegranate lemonade and some fun appetizers I’ve been testing. As great as Thanksgiving is, ham happens to be my favorite meat so Christmas Eve dinner always takes first place in my heart. Make sure the vegetables don’t overlap. 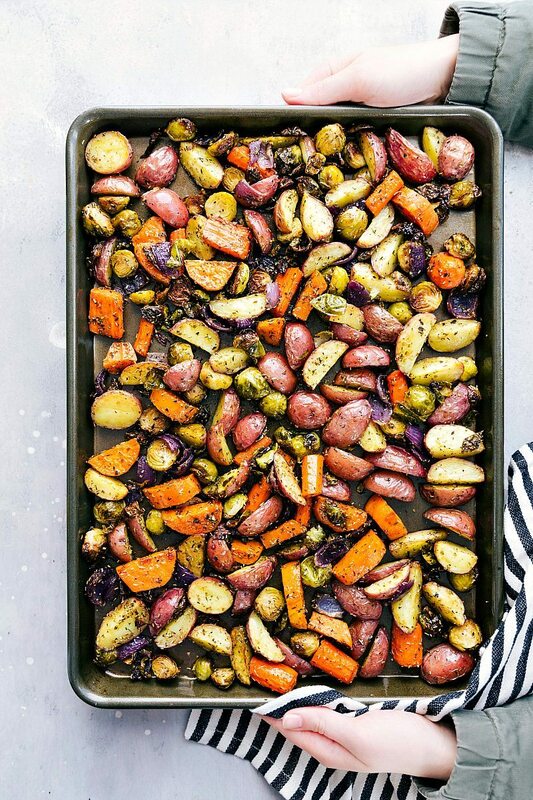 If you pile vegetables on top of each other on your sheet pan, they will end up steaming instead of roasting. While steamed vegetables are definitely not bad there is no comparison to a good roasted vegetable! To avoid overlap, use a very large sheet pan or roast the vegetables on 2 different sheet plans. Make sure the vegetables each have their own “space” and aren’t overlapping with each other. Use a delicious spice mixture. 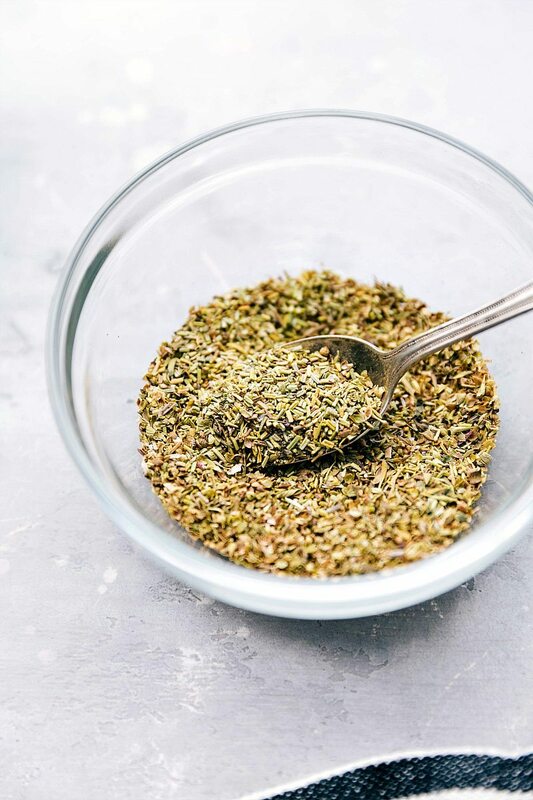 This recipe includes my absolute favorite spices with roasted vegetables! But of course, adjust the amounts (and types of seasonings) to your preference. In my opinion, freshly cracked pepper and a good sea salt make a world of a difference from traditional salt and pepper! Flip the veggies halfway through baking time: Around the 20 minute mark of roasting these veggies, make sure to flip and stir the vegetables around a bit. This ensures an even roasting on ALL sides of ALL the veggies. Preheat oven to 400 degrees F. Grab a large (11x17-inch) or 2 smaller sheet pans and set aside. Prepare the veggies: peel the carrots and cut into large chunks (if they are thick do 1 inch chunks if they are thinner do 1-1/2 inch chunks), remove the outer leaves of the brussels and halve them, halve the baby red potatoes (quarter especially large ones), halve the red onion and cut into thick 1-inch pieces, peel the sweet potato(s) and cut into large 1-1/2 inch chunks/slices. Place on middle rack in oven and bake for 35 to 40 minutes, flipping the veggies 20 minutes into baking time. Remove from the oven and enjoy immediately. I just had a few leftover slices of squash, green pepper and onion, so I tossed them with a 1/4 each rosemary, thyme, basil, garlic, olive oil, balsamic vinegar, and a shake of salt-free seasoning. I placed them on a baking pan lined with aluminum foil and sprayed with non-stick spray. Roasted at 450 and broiled on high for the last couple minutes. In the oven about 10-15 minutes. Delicious! We will make this again and again this winter. Literally life changing. BEST roasted vegetables ever!! LOVE these, thanks for another great recipe! So happy to hear these were a hit! Thanks for the comment! 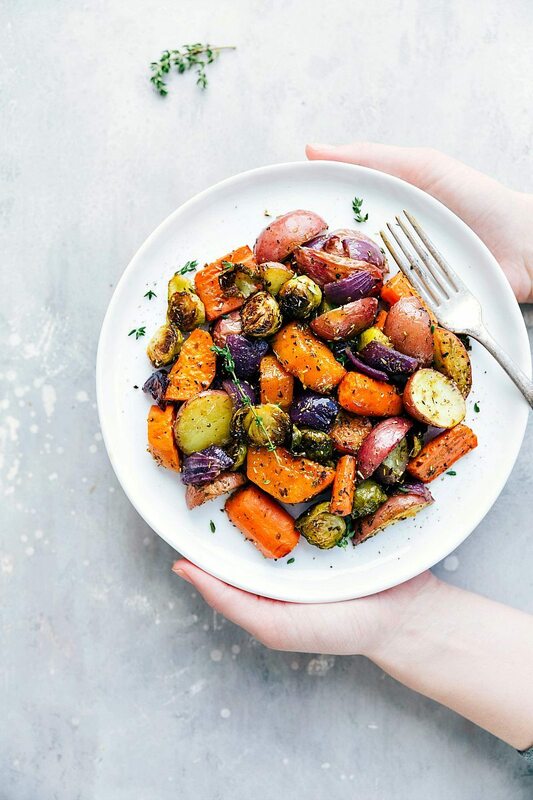 We luv, luv, luv these fabulous, so-healthy roasted vegetables! Is there any suggested way to manage with only 1 oven on Thanksgiving? Typically, the turkey comes out and rolls go in while the turkey is carved & dinner is served. Can the vegetables be “roasted” in an electric skillet or placed in the oven with the turkey for the last 40mins??? Thanks so much Coco! 🙂 I’ve never tried cooking them alongside something else, but I think placed in the oven with the turkey would be your best best! They might not get as roasted or need a little bit longer though. Happy Thanksgiving! Easy & so good! The colors are so vibrant and the flavors are wonderful – it’s such a great way to enjoy veggies! I will definitely make this often. Thanks, Chelsea. This looks delicious! Do you know if these would work as leftovers? For example if I prepped a big pan of these toasted veggies to meal plan lunches for the week? Looks great, easy to make, I’ll try your recipe and see how it works:)). Love all the photos your posted. Thanks so much for sharing Chelsea!